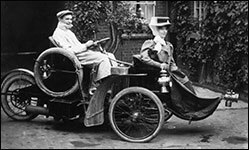 In the early 20th century the gentry would take excursions to the coast or tour the countryside making visits to friends and family. This was the birth of the “holiday” and some of the local factory owners took their employees on “annual outings”, perhaps to a neighbouring village, where they would be served tea and enjoy the sights of another place. Churches would sometimes take their members for a day trip to visit the church in nearby villages. With further expansion, so the factory owners organised more adventurous trips for their employees, and at the peak John White took four trains carrying his employees to London. Air transport was born after aeroplanes had proved their worth during the First World War, and after the Second World War travel to foreign countries gradually became affordable to the masses. The huge difference between life in 1900 and life in 2000 was due to the advancement of transport. Horizons for everyone had changed in needs, wants, abilities, capabilities and availability.